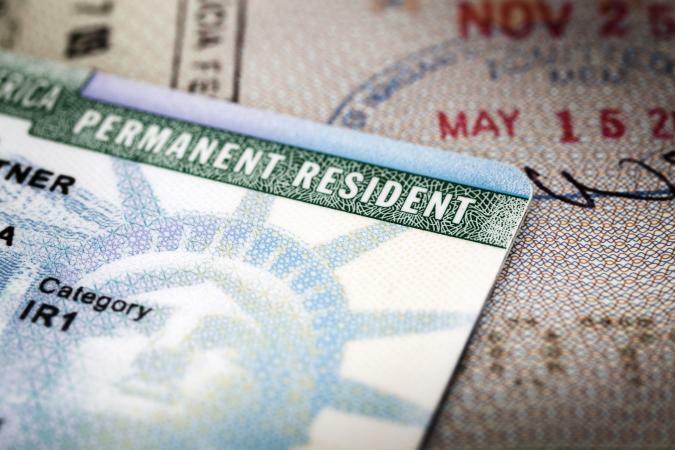 A lawful legal permanent resident (LPR) must present a Permanent Resident Card ("green card") to enter the United States and must carry it at all times when residing in the country. There are regulations for green card holders regarding traveling in and re-entering the United States, as well as additional rules imposed by the airline and the embassy of the country visited. LPRs must present a valid, unexpired green card (Form I-551), in addition to travel documents such as a valid passport from their country of origin, foreign national ID or U.S. driver's license to re-enter the U.S. There are several important regulations to keep in mind when leaving and returning to the United States. LPRs must submit a Re-Entry Permit if gone for more than one year. You should apply for a reentry permit on Form I-131 prior to leaving the U.S. (and pay the filing fee). To re-enter the United States, LPRs gone for two or more years must file a Returning Resident Visa (Form SB-1) at the nearest embassy or consulate. As an SB-1 applicant, you must submit to a medical exam and get a visa. LPRs who are out of the U.S. for more than 180 days are subject to new immigrant inspection procedures as per the Immigration and Nationality Act 8 USC 1101. LPRs may need a passport to enter another country. It is best to check with the embassy of the country you visiting in order to meet their travel requirements. Airlines may have additional requirements regarding boarding, so it is best to check with them prior to travel. U.S. Citizenship and Immigration Services issues employment and travel authorization on a single card to applicants filling out Form I-485 (Application to Register Permanent Residence or Adjust Status). There are 27 immigrant categories and you no longer have to submit Form G325A as the information has been incorporated into Form I-485. This makes travel easier. If you are an LPR who wants to become a naturalized citizen, any travel outside of the U.S. may be limited by continuous residency requirements. It is advisable to limit international trips to six months in duration. In accordance with new immigration laws, travel outside the United States by aliens who are in the process of adjusting their status or applying for an immigrant visa must get proper documentation before leaving the United States in order to re-enter. Those holding H-1B or L-1 status and have a valid visa do not need to apply. Advance Parole is a form of temporary travel authorization that works like a visa. Three types of aliens in the United States should, prior to departure, obtain Advance Parole in order to re-enter the United States. Generally, you do not need an Advance Parole Document to travel directly between parts of the United States, which includes Guam, Puerto Rico, U.S. Virgin Islands, American Samoa, Swains Island and the Commonwealth of the Northern Mariana Islands (CNMI), without entering a foreign port or place. However, check with your transportation carrier first to ensure the trip is direct. Advance Parole can be approved for multiple uses or a single trip depending on your status. A green card makes it easy to travel domestically in the United States but there are certain things to keep in mind to avoid confusion. Green card holders are required by U.S. immigration law to keep their green card with them at all times, especially when traveling. This applies to travel to different states within the U.S.
Green card holders traveling domestically in the U.S. should always have a photo ID, such as a driver's license, in order to avoid any potential confusion. Green card holders do not need to carry a passport for domestic travel within the United States. That said, it's never a bad idea to have plenty of documentation, and if you have a passport, you may wish to keep that with you throughout your domestic travel as well. If flying domestically, it is wise to carry your passport with you as a form of photo ID. Many states are in the process of changing their laws about what is acceptable in terms of photo identification for flying. A passport is the "gold standard" when traveling, so if you have one, carry it. Green card holders can enter a number of countries outside the U.S. without a visa. It is always important to have a valid passport with you at all times, as well as your unexpired green card. Airlines and immigration officials may ask for certain documents upon arrival. If you are a green card holder and you plan to fly or transit through Canada, you need a valid green card and an eTA (Electronic Travel Authorization) that is electronically linked to your passport from your country of origin. If you are traveling to Canada by land or sea, you need to provide proof of your U.S. lawful permanent resident status with a green card. To board a flight to Canada, you will need to bring the eTA, a valid passport from your country of nationality (that was used to apply for your eTA), and your valid green card or your valid Alien Documentation Identification and Telecommunication (ADIT) stamp in your passport. If you get a new passport after receiving an eTA, you will have to reapply for a new eTA. When you check in for your flight, the airline will confirm that you have an eTA and proof of status in the U.S. When you get to Canada, a border services officer will verify these documents. All legal residents of the United States regardless of their nationality can travel to Mexico as tourists if they are in possession of a green card and a valid passport. A tourist card is issued on board an aircraft or the port of entry to be able to travel to Mexico as tourists, in transit or for short business trips. You must carry a valid passport and your U.S. Permanent Resident Card issued by the United States government at all times. A Permanent Resident Card makes traveling within the U.S. easy, although it is important to always carry a second valid ID, and if you have one, a valid passport when flying in order to avoid confusion. Depending on your destination and length of stay, international travel with a green card can be tricky. It is important to keep up to date with the regulations of the U.S. government, the airlines and the embassy of your destination.